When summer is nearing its end, I start craving soup! This one-pot wonder takes a bit of prep time because of all the chopping you have to do, but it is well worth it. It combines all my favorite things (including bacon, ham, fresh veggies and cheese) into one creamy, comforting chowder. Serve in big mugs, oversized bowls or hearty bread bowls, and you’ve got the recipe for an awesome way to start the autumn season. Now bring on the cold! In a large cast iron Dutch oven, melt butter over medium-high heat. Add onions and cook until translucent, about 3 minutes. Add the bacon and ham and cook until it starts to brown, about 3 minutes. Add bell peppers and jalapeños and cook for 2 minutes. Add the corn and cook for 1 minute. Sprinkle flour evenly over the top and stir to combine. Pour in chicken stock and stir well. 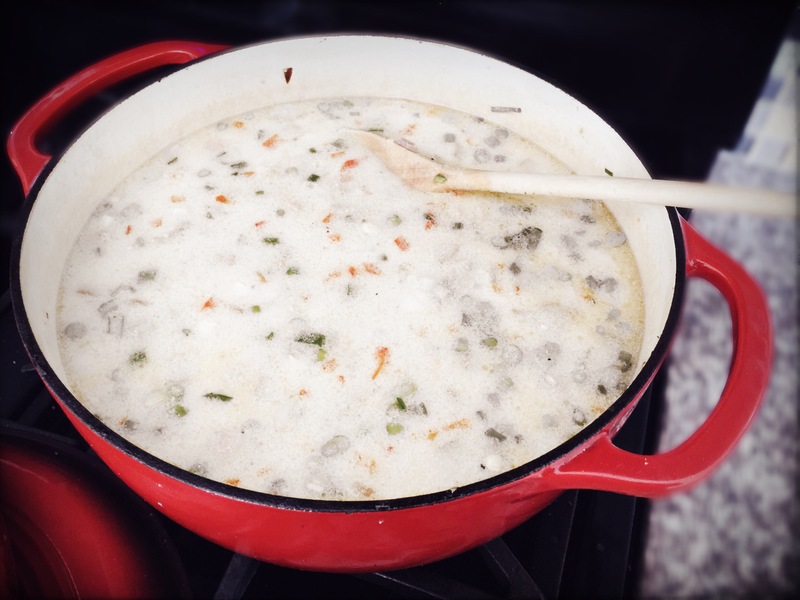 Allow this to thicken for 3 or 4 minutes, then add half-and-half, stir. Bring to a boil, then lower heat to low, cover and simmer for 20 minutes. Stir in cheese and green onions. When the cheese is melted and the soup is hot, add salt and pepper to taste. Want it a little hotter? Add pepper flakes for added heat, stir. Ladle soup into bowls and serve immediately. Autumn is just around the corner, and our test kitchen is cooking up a storm to get you ready for cooler temperatures with tasty eats that fuel the body and warm the heart. Our Creamy Corn and Ham Chowder is one of recipe you’re going to add to your repertoire!